Growing old is easy, growing up is much harder to do. This is just one of the concepts that is explored in “The Boys Upstairs” the post-Xmas production at the Above the Stag Theatre. Set in an apartment in Hell’s Kitchen, New York (and there was me thinking it was just a reality TV show) this hilarious show examines the lives of three recently graduated gay guys who are starting to make the transition from students to adults. Josh (Simon Walton) and Seth (Stanley Edridge) share the apartment and are waiting for the return from Europe of their best friend Ashley (Joe Leather) so that the three of them can have a good old fashioned ‘Boys night’ just like at college. Of course, things are slightly different now. Seth is a teacher and is in love with Matt (Hugh O’Donnell) a slightly older man who Josh doesn’t really approve of, possibly because he is jealous that Seth has got the one thing he can’t. Josh himself is a bit of a trustafarian who is an intern for a marketing company working on his great idea to propel himself into the realms of social media stardom. Their friend Ashley could be described as a bit of flake. His interests are having fun, men, alcohol, men, himself, men, friends and men – not necessarily in that order. He is the good time had by all and really thrives on his reputation. That is until he and the other boys meet Eric (Daniel Gracia) who has moved in to the apartment below Josh and Seth. All three – even Seth though he won’t admit it – are smitten and have one big question that they want to ask. Is the extremely HOT Eric, gay? Surprisingly, I’m not going to tell you the answer to that one in this review although it is the over-arching question hanging over the entire show. The boys have a lovely time drinking, partying bitching amongst themselves and, in Ashley’s case, bringing bits of ‘trade’ (all played exquisitely by Hugh O’Donnell) back to the apartment for a quick fumble on the couch and then a hurried goodbye as the hangover sets in. This lifestyle is great but reality does set in after a while. Seth and Matt want to live together, Josh wants his idea to succeed and also wants to meet someone special and even Ashley sometimes just wants to stay in with a glass of wine watching re-runs of ‘Ab-Fab.’ Now, this wouldn’t be a gay themed play without some major league dramas and all three experience them as we travel along their road with them. Josh meets a handsome Doctor (Hugh O’Donnell) who turns out to be not exactly what he seems. Seth does something completely unforgivable to Matt’s sheets and Ashley has a one night stand with a guy that cannot find the keys to the handcuffs. Even handsome Eric’s life isn’t as easy as he would like. But ultimately, the strands of these guys’ lives work themselves out and the ending is as surprising as it is fabulous even if some of the problems are left with their resolution to be guessed at by the audience. I loved everything about this show. The writing by Jason Mitchell was spot on and his characters are extremely familiar to anyone either in the gay community or who knows gay people – some of the conversations on the stage were almost verbatim copies of ones I’ve had with friends over the years. Andrew Beckett’s direction is fast paced and perfect for the show and his actors deliver it superbly. Little touches, like adjusting cushions on the sofa, all felt correct – it’s what you do in your own flat – and the set (designed by Zoe Hurwitz) really did feel like a genuine apartment. The actors were perfect and much as I hate doing it, I do have to single out Hugh O’Donnell who played 6 completely different roles fantastically, and at one point gave a wonderful monologue using the most amazing musical theatre quotes, with appropriate movement and hand gestures to describe his character, Gabie’s evening with Ashley, in rather graphic detail for which he received a well-deserved round of applause. 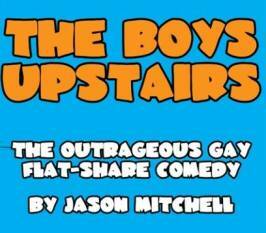 “The Boys Upstairs” is not for the faint-hearted, it is rude and crude in places and Ashley in particular spends a lot of time in just his underwear – not that anyone in the audience (me included) was complaining. As Director Andrew Beckett says in the programme “People look for something fun and exciting for the New Year. People want to continue the party feeling at the end of the festive period and this seemed the perfect play for a rainy January” I couldn’t agree more.